Nothing can kill a conversation more quickly than bad breath. You may not always be able to brush your teeth right after eating a meal, but that does not mean you have to live with obnoxious breath due to garlic, onions or other strong-smelling foods. 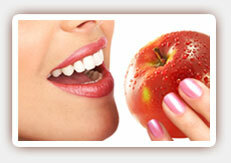 Some foods have been found to decrease the incidence of bad breath or even freshen your breath. Did you know that the green stuff on the side of your plate is more than a garnish? Parsley and herbs that decorate your plate can freshen your breath instantly. Rosemary, basil, tarragon, coriander and mints can all work just as well as parsley. If you don’t want to chew herbs, you can also enjoy them steeped in hot water to make a tea. Fruits can also be a great way to sweeten your breath after a meal. Not only do they pack a healthy punch of nutrients, but their water content can also help rinse away the food particles that feed oral bacteria. Citrus fruits can add an extra touch of freshness while apples, pears and other fiber-rich fruits provide mechanical cleaning to remove particles and stimulate salivary glands to rinse them away. Berries and melons are rich in gum-strengthening vitamin C and can help you keep your breath fresh and improve your oral health at the same time. Finally, sometimes a tall glass of iced water is all it takes to keep your breath inoffensive. Being hydrated reduces the risk of dry mouth and can help rinse away pesky food particles that contribute to malodorous breath. If you dislike the taste of water, enjoy tea instead, or add several slices of lemon or other citrus fruits, berries or even cucumber slices to your water to make it more palatable and refreshing. Chronic bad breath may be a sign of serious dental disease. Contact us today to schedule your consultation with West Hollywood dentist, Poneh Ghasri DDS or to learn more.